I have noticed some writers squirm when the word "prolific" is used to describe them. Why is this? I also have noticed some of us call other writers prolific, but we struggle to believe we could be, too. I'm puzzling through this conundrum today as I ponder the craft of writing, my Sunday habit of late. I'd like to share a few words of encouragement on the subject. 1. Writing is a commitment. It takes effort. You have to decide for yourself when, how often and for how long you will write. If you are looking at friends' writing lives and wondering how they are getting published so much, the answer is probably simple, yet difficult: They have decided to commit. They have set goals, and they have put their work in front of editors and publishers. Repeatedly. You can do this, too. 2. You don't have to be a prodigy to be a writer. I suspect this is why some writers bristle when you call them prolific. The word can carry a connotation that the published writer is a wunderkind. That the prolific writer is exceptionally brilliant or lucky. But that's not necessarily true. Behind the scenes, the prolific writer has made a difficult choice to do the work, regardless of the cost. And that deserves respect. 3. Writing daily adds up. Let's brainstorm. If I write five poems a week for a year and submit half of them for publication, even if 70 percent of the poems I submit are rejected, I'll have 39 published poems at the end of the year. That's enough to compile into a chapbook of poetry. Wow. 4. Making publishing inroads is hard work. Your writing might be great, but maybe you haven't found a journal or publishing house that's a good match for your style and themes. The writing friends you see getting published might have good instincts about where to submit work. Or they might have been born into a literary family with connections. Or, they went to a university with ties to a publishing house. The good news is, you can develop your instincts. You can network to make more connections. Be patient. It will take time. 5. Prolific, schmolific. Some of the world's best-loved writers are known for the quality, not quantity, of their work. (Think Harper Lee.) The important thing is to write because you love it, not because it gives you status. If love is your motive, you'll stay grounded through everything the world throws your way. 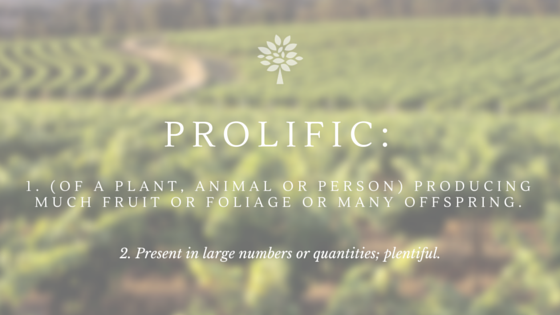 When you call someone "prolific," what do you mean by it? What do you think others mean by it? I'd love to hear your thoughts. Leave a comment below (no account necessary). And just think, Harper Lee just doubled the number of her published novels.